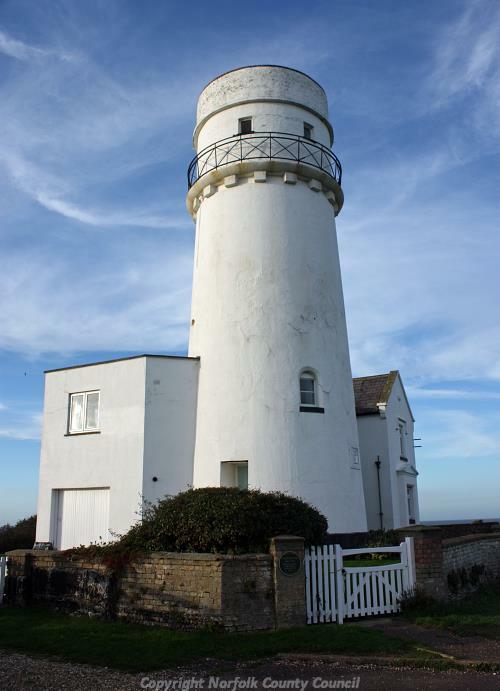 A 19th century lighthouse, the site of earlier lighthouses and the site of a Royal Observer Corps post. The current lighthouse was built during the first half of the 19th century. It superceded a wooden structure that was built in the late 18th century; this building itself had succeeded a lighthouse built around 1665. 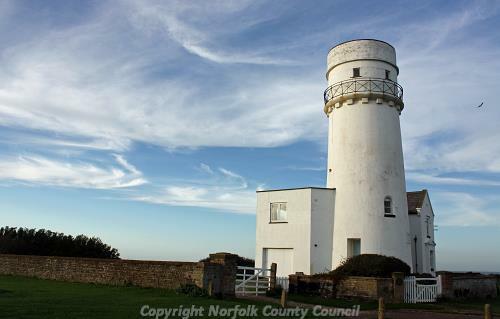 The standing building was used as a lighthouse until 1921 and from 1934 until 1957 it was used by the Royal Observer Corps. In 1957 an observation post was constructed alongside the lighthouse and this functioned until 1968. The lighthouse is now used as a private residence. (S1) says 1840, superceding a wooden one. It was dismantled in 1921. The wooden one had a parabolic reflector installed in 1776 (S2). This reflector was of cotton strands stretched across and was Britain's first. (S3) in 1962 described this as connected by castellated wings to two gabled two storey houses. These have been demolished; now modern houses are built into the base of the tapering tower which has a balcony on corbels with iron railings a surprising distance below the top. The lantern has been removed. E. Rose (NAU), 1 April 1981. Being restored or renovated 1987. (S4) records one standing in 1809. Attached to the south side of the enclosing wall was an Royal Observer Corps post; the lighthouse was used for this purpose from 1934 but the post was constructed in November 1957 to prevent crew members from climbing through the living quarters; the lighthouse was altered at the same time. Post closed October 1968 and only cropmarks in grass remains. Press cuttings (S7)-(S11) in file. NGR amended from original TF 6761 4205. M. Horlock (NLA), 17 December 2002. December 2004. Land based fieldwork phase of the Norfolk Rapid Coastal Survey. NHER 41012, context 6. J. Allen (NLA), 1 December 2005. A coal fired lighthouse stood at the site from 1665 until 1777, when it was destroyed by fire. The replacement lighthouse (possibly the wooden structure mentioned above) had an oil fired light. D. Robertson (NLA), 20 April 2006. A carved wooden wolf has been placed near the lighthouse, next to the ruins of a chapel built to mark the spot where St Edmund first landed in 865AD. D. Lefeuvre (HES), 8 August 2011. --- Aerial Photograph: TF6742 A,B,F-H; TF6741 E-J. --- Newspaper Article: Eastern Daily Press. 2008. Enjoy the high life at a hefty discount.. 28 November. --- Newspaper Article: Eastern Daily Press. 2010. The east coast's guiding lights.. 10 August. <S2> Publication: Hague, Christy. 1975. Lighthouses. <S4> Serial: Blomefield, F.. 1809. An Essay Towards a Topographical History of the County of Norfolk.. Vol X. 375. p 324. <S5> Archive: Ordnance Survey Staff. 1933-1979?. Ordnance Survey Record Cards. TF 64 SE 43. <S6> Article in Serial: Catford, N.. 1999. ROC Underground Posts in Norfolk.. NIAS Journal. Vol 6, No 4. pp 59ff. <S7> Newspaper Article: Eastern Daily Press. 1996. Front row seat for fans of the sunset.. 7 March. <S8> Newspaper Article: 1996. Rare chance of a lighthouse.. 8 March. <S9> Newspaper Article: Lynn News. 1996. The most marvellous sight in the world.. 8 March. <S10> Newspaper Article: Lynn News. 1996. Lighthouse in danger.. 14 May. <S11> Newspaper Article: Eastern Daily Press. 2001. Coastal landmark - picture.. 5 September. <S12> Graphic Material: Various. Various. Architectural plans..
<S13> Unpublished Document: Robertson, D., Crawley, P., Barker, A., and Whitmore, S.. 2005. NAU Report No. 1045. 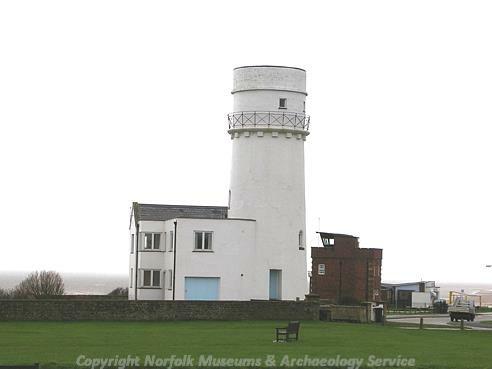 Norfolk Rapid Coastal Zone Archaeological Survey. Assessment Report and Updated Project Design..
<S14> Newspaper Article: Eastern Daily Press. 2011. The day a boy king landed in Norfolk. 29 June.